This card was for this week's SUDSOL "color challenge" using only neutral colors. I had chose Basic Gray as my main color to use in this card challenge. This card can be used for many things: Valentine's Day, Wedding, Anniversary, Thank You, or really any ocassion. 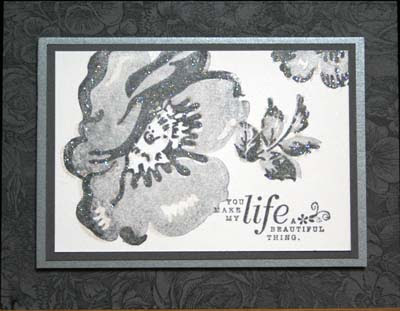 Ink the Floral background stamp with Basic Gray ink and stamp onto Card front. On White Shimmery paper, stamp the Wild Rose bold stamp in Basic Gray AFTER stamping-off on grid paper (so it appears as light gray). Then ink the Wild Rose outline stamp in Basic Gray and stamp over the bold image. Do the same technique for the leaves. Ink the greeting stamp in Basic Gray and stamp in bottom right corner. Add Dazzling Diamonds to outline of Wild Rose images. Adhere layers and add Dimensionals.